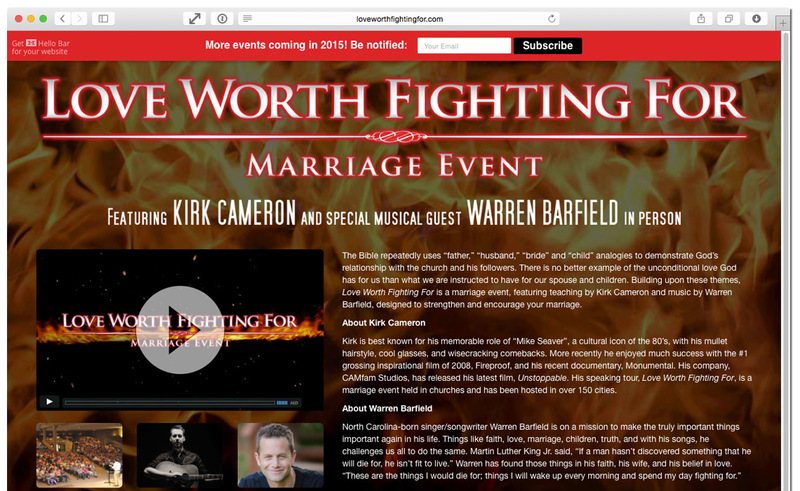 The Love Worth Fighting For Marriage Event features Kick Cameron and Warren Barfield. In addition to designing the website for this event, I’ve served as Feed Your Faith’s digital asset manager since this event’s inception in 2009. One notable aspect of the event’s website is its ability to handle large amounts of traffic. Whenever Kirk’s web team posts a link to our site from Kirk’s Facebook page, we can see traffic spikes of 200 to 300 visitors per second. To handle this type of load, I have the site hosted on a cloud files CDN. Solving traffic spike problems is one of the many things I do as a full-stack web developer.